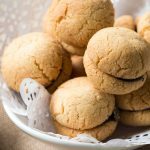 Baci di Dama are delicious biscuits originating in Piedmont, specifically in the city of Tortona where they were first made a century ago. The name means “lady’s kisses” because they look like two lips holding together a chocolate kiss. Baci di Dama are really tasty also with white chocolate or Nutella! Knead butter with sugar, then add the flour and knead as you would do for a shortcrust pastry. Let chill in the fridge. Shape the dough into hazelnut-size balls and transfer to a baking pan lined with parchment paper. Bake at medium temperature for about twenty minutes. When cooled, take two pieces and stick them together with a bit of melted dark chocolate in the middle. Repeat with the other pieces.